Recap of the Last Five (Games 11-15) · Let's Go Amerks! Welcome to the third part of a 15 part season series highlighting the last five games (the last segment will be six games) showing off the stats, standings, highlights, transactions and whatever else took place prior to the next five games. The goal is to post these the day of the next game of a five game set. A little different than a weekly format to give us a better snapshot of trends as the season goes. The team finished the last five games with a record of 3-2-0-0 and are heading into the game tonight looking to forget the embarrassing loss on Friday night. Two regulation wins, an overtime win and two losses as a result of being outplayed is the simple way to summarize the last five. After the first 10 games of the season the leagues top five leaders in points were dominated by Olofsson, Redmond and Pilut. Everything can quickly change in the American League and Olofsson has dropped to 17th in the league after missing two games. Redmond and Pilut are still top 10 in the league and you’ll notice two other former Amerks in that list as well, Phil Varone and TJ Brennan. 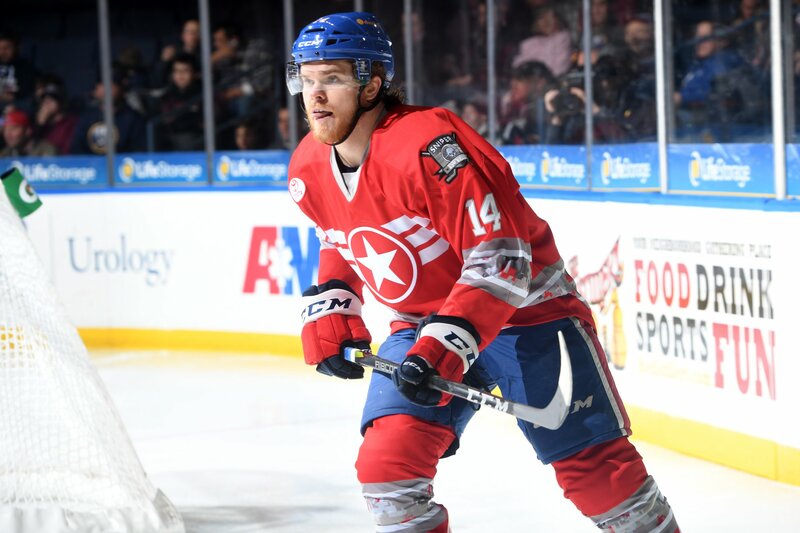 Zach Redmond continues to be on pace to break the all-time single season Amerks record for goals by a defenseman and will likely occur before 2018 is over. The record is 18 goals and he has 11 goals in 15 games. The two losses in the last five game span is a result of poor periods of hockey. The team didn’t show up in the first period against Hershey and then last night against Springfield they had an embarrassing second period that cost them the game. It doesn’t matter who you play in the American League, any game can be won by any team in any 20 minute span. Sean Malone returned to the lineup after missing the first 12 games with an injury and he had an immediate impact. Winning face-offs, winning puck battles and playing a solid two-way game. His return was immediately felt and helped with Kyle Criscuolo and Victor Olofsson out of the lineup due to injury. Speaking of injuries, Kyle Criscuolo has missed six straight games with a lower body injury. He blocked a shot on October 26th, left the game and hasn’t played since. He’s the only player that didn’t make the trip this weekend. He had returned to skating with the team earlier in the week before leaving a practice early. Victor Olofsson has missed two straight games with a lower body injury. He hasn’t skated with the team but has been skating with the training staff. He had missed the third period on November 7th with no apparent signs of injury. Both players are considered day to day. Scott Wedgewood was signed on the first day of free agency by the Buffalo Sabres to be the number three goalie in the organization and 15 games into the season there’s still questions about whether or not he’s the one. He’s been reliable in net for Rochester but games like the one on Friday night bring more questions than answers. He’s winning games but isn’t stealing games. Is it fair to question the goalie when the team struggles to play defensively in front of him? Where is Brendan Guhle? Through 13 games he has 8 points (2G+6A) but he isn’t the same fast skating offensive defenseman that we saw last season. He isn’t flying down the ice creating scoring chances and also getting back to the defensive zone to stop other teams. He seems to be stuck in limbo as the odd defenseman. Redmond and Pilut are playing the most minutes and used in all areas of the game. MacWilliam and Borgen are the defensive defenseman relied on for penalty kills. That leaves Guhle and whoever he is paired up with to make up other areas of the game. It’s pretty simple, score more than the other team and win. Goal scoring was even in the last five games with 18 for and 18 against. Besides the second period of game 15 versus Springfield the Amerks had only allowed one goal against in the 2nd period over the span of four games. The team is getting more shots off against opponents but that doesn’t always equal a win as shown in games 11 and 15. The trend continues to be shooting more pucks which is resulting in more goals. This will be a topic to come back to halfway through the season. After starting the season with one of the most lethal power plays in the league the team went into a rut. Zach Redmond scored in game 15 vs Springfield after the team was held scoreless in 24 straight attempts. Heading into the 16th game of the season the Amerks continue to stay in first place in the North Division with almost every team having played 15 games. Syracuse still has two games in hand and is on a 5-0-1-0 streak. Déjà vu of last season after the Crunch started slow and then started to find their way and based on winning percentage they’re in second place. The top two teams overall Eastern Conference standings have stayed the same since the last five recap with Charlotte ahead of Rochester. The season started with two losses against Charlotte and then a big loss against Springfield last night raises a question on whether or not the North is that strong versus top teams in the Atlantic. Every team loses at some point, we’ll see how the Amerks respond. Two goals from the same game. Zach Redmond with the overtime game winner versus Syracuse. And I’ll also include the first pro goal in the same game for Andrew Oglevie after Alex Nylander went crashing into Crunch goalie Eddie Pasquale. Sean Malone, Andrew Oglevie, Jack Dougherty, Matt Tennyson, Tyler Randell all returned or were cleared. Sean Malone had been in Rochester working on rehab since the end of training camp but his assignment couldn’t be made official until he was cleared to play. November 16th highlight video hasn’t been posted as of writing this but you can view highlights in the game recap article.